This issue's article is an article from the Los Angeles Times of Feb 8 1958, when Bharati Krsna Tirthaji made his U.S. tour. It was written by Richard Mathison,. One of the most important - and least known - personages in the world is visiting in Los Angeles this week. His actions and utterances dictate the thinking of millions of Hindus. But because he preaches only peace and co-operation he is seldom heard in the western world. His correct title is His Holiness Sri Jagatguru Sri Swami Shankaracharya Bharati Krishna Tirth of Gowardhan Math, Puri. His ecclesiastical job is a big as his title - he's spiritual leader of the Shankaracharya Order of India. He's 82, weighs about 100 pounds, has a closely cropped gray beard and wears thick glasses which give an owlish look to his expressionless face. His robes are three shades of red - called "ocre" in India - and signify that he has renounced the world. In the center of his forehead is the holy vermillion mark of purification and the yellow dye surrounding it signifies he's of the sacred swamiji rank. If he seems a strange figure in bustling Los Angeles, his studied, barely audible remarks soon dispel the illusion. For he talks of the "oneness" of all things, of the underlying sameness and solidarity of the universe, of the foolishness of conflict between temporal and spiritual things. "The causes of individual clashes between countries must be eliminated" he says. "I quarrel only with quarreling, especially in the name of religion." An ascetic and mystic, he will discuss nothing of his life and experience before he became head of the order. It is all part of a world he has departed. Asked if he thinks the world needs more men such as Mahatma Gandhi, he reacts as if the famed Indian leader has not died. "I do not discuss personal matters," he replies softly. What does he think of western "materialism" and the H-bomb? He seems neither awed nor annoyed. "The material and spiritual are one" he explains. "There is no conflict. The development of material science by 'external' scientists is cause for congratulation, not condemnation." The order has been in existence since about AD 788. But its roots go back unrecorded centuries before that. It was about 1200 years ago that the Hindu philosopher Shankaracharya broke with the established sects. The reason, the swamiji explains, is because the founder thought the powerful sect leaders of the day had strayed from the true meaning of religion. "Ceremony, ritual and material concerns had developed. Internal unity had been forgotten. The order re-emphasized the spirit and the unity and the oneness of all things." Since then there have been many leaders of the order. But the swamiji is the first to venture from India. "I am here because I thought there was need" he says. A guest of the Self-Realization Fellowship at its headquarters on Mt. Washington, the swamiji has a busy schedule for the next six weeks. He will speak over radio and television. He will address a gathering at UCLA Feb. 20 and another group at the Wilshire Ebell Theatre, Feb 23. He will tour colleges in the Southland carrying his message. On Feb. 28 he will leave for lectures in Denver, Chicago, Detroit, Cleveland and New York. He will also receive honorary degrees at several universities. "I will talk of many things" he explains. He plans to meet with physicists and mathematicians. He is said to be the discoverer of several important mathematical concepts, culled from his years of study of the ancient Vedic scriptures. As for his talks, he is fearful that people may not understand him. "I speak only formal academic English" he says. "I apologize that I know nothing of American expressions." This new website at www.vedicmathsindia.org is excellent and has a lot of new material. Gaurav Tekriwal, who runs the site and the Vedic Maths Forum India has done a lot of work in many areas in promoting Vedic Maths in India and beyond. You will see Workshops, books, DVDs and tutorials are available at the website. The Vedic source of one of the Vedic Maths sub-Sutras is given here, as discovered by the current Shankaracharya of Govardhan matha, Puri; the Shankaracharya also intends to reconstruct the lost volumes of Swami Bharati Krsna. Below are some details about the site, given by Gaurav. It gives me great pleasure to write to you today about our newly launched website http://www.vedicmathsindia.org. This, I think should put an end to all the debates about the sources of Vedic mathematics not being Vedic. I think this is the first addition to the history of Vedic math in many years. These pictures are rare and have not seen before and have been taken out of my travels throughout the country. It is for the first time they are being displayed on the internet and some of them have been taken out of some books. I have some more snaps which will be added when I finish scanning them. You can subscribe to the Blog by entering your name in the box and be updated about the pictures and other relevant articles on Vedic Mathematics which we publish from time to time. The website's tutorial section is done in PowerPoint slide shows and clearly explains some of the Vedic methods. 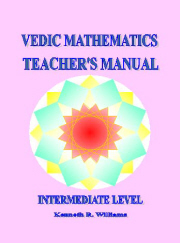 This is a good resource for people who do not have access to a Vedic math workshop. If you live in the Greater Vancouver Area and have past experience in teaching Vedic Math, please contact me at or 1.778.840.1441 to arrange a meeting. I am interested in learning the rudimentary material but would like to eventually steer the lessons towards preparation for the GMAT. If there is a Vedic Maths tutor in the Basildon area please contact Stephen Ward at who would like to learn the system.